Suppose, just for entertainment purposes, that we wanted to have a sane, rational, and even informative discussion about what to do about our public deficits and debt (the latter being the cumulative sum of the former)—one that asks the questions posed in the title but doesn’t automatically default to the “hair-on-fire, we’re Greece!, hard choices, serious sacrifices” that we too often get from the deficit reduction industry. First off, “stabilizing the debt” means to stop the debt ratio—debt/GDP—from rising (where “debt” means debt held by the public—that’s what matters for all that follows). For our debt to grow more slowly than our GDP, our deficits don’t have to be zero, but they do have to be below 3% of GDP. * Why is that a good thing? Well, in fact, it’s not always a good thing. In times of crisis—recessions, depressions, war—the ratio goes up for good reasons. Our borrowing temporarily outpaces our growth in order to offset some disaster. But there are also good reasons to lower the debt ratio when the economy’s solidly back on track. First of all, in weak economies, interest rates tend to fall and servicing our growing public debt tends to be the least of our worries. But as the economy improves and interest rates go up, it’s more expensive to service a larger stock of debt, so in the “interest” of not having to devote resources to debt service that we might rather use for education, infrastructure, and so on, it’s good to get the debt on a declining trajectory. Also, a lower debt ratio leaves you better positioned the next time your public debt needs to go up. It’s easier to make that case when you start at 40%—where we were in 2009—than north of 80%. A debt ratio that keeps growing in good times and bad signals a persistent imbalance in the willingness to raise the needed revenues to pay for government without borrowing. This sounds like the very definition of unsustainable and eventually government borrowing will crowd out everything else while spooked investors insist on large interest rate premiums, further pressuring the debt spiral. At that point, “we’re Greece” has more bite. On the other hand, there’s Japan, whose debt ratio has been rising since 1990 and is now around 200% (that’s gross debt; debt held by the public is around 150%, but still, the point is it’s gone in one direction for decades). Yet, interest rates remain low and investors still consider Japanese debt to be safe. So one should avoid global rules, like “a debt ratio over 90% spells doom” or “if we don’t lower our debt ratio the bond vigilantes will attack and force rates way up” or “public borrowing always crowds out private borrowing, leading to slower growth.” There’s no good evidence for any one of these claims, which is not to say public borrowing, for example, will never compete with private borrowing thus pressuring rates and slowing growth. It’s saying, like in the Japan case, you’ve got to look at cases. When strong private sector growth is back, the CDSH asks “now that we’re back to robust growth, are our revenues and spending lined up such that the debt we built up during the down economy will soon start to recede?” That is, deficits and debt that grow in full employment economies are called “structural” budget deficits as distinct from cyclical ones. They’re to be avoided. OK, so…back to cases, like right now. As noted, though few are listening, the CDSH fiscal policy right now is “accelerator now, brake later.” (Although as noted in recent posts, I’ve shifted from “help!” to “do no harm!”). But this position leaves two interesting and debated questions: when is later and at what level should the debt ratio be stabilized? The first question is easier. It’s when the indicators of growth are consistently flashing “go.” GDP is growing above trend, unemployment is coming down, private investment flows are moving again. Interestingly, the Fed has explicitly adopted this type of rule, based on unemployment and inflation. For a thoughtful debate on the second question—at what level would we want to stabilize the ratio?—see these two papers from CBPP, by Richard Kogan, and EPI, by Ethan Pollack (the CBPP analysis will be updated any minute based on new CBO numbers but the results are unlikely to change much). The Center argues for stabilization of the debt ratio at about its current level of 73% by the end of the 10 year budget window. EPI argues that this is an arbitrary level and there no reason not to stabilize at a higher level, which would, of course, require less deficit reduction—about half of what CBPP calls for—and thus arguably be less damaging for growth. Both positions are consistent with the tenets of CDSH, but EPI clearly argues for more accelerator now and less brake later. In this spirit, EPI stresses a point I’ve made many times: more temporary spending now in the interest of jobs would raise the level at which the debt ratio is stabilized but not its growth. Their figure below shows their two stabilization scenarios, both of which stabilize at higher levels than CBPP. The higher line stabilizes at around 85%, though if you want to assign a growth multiplier to the stimulus, it would stabilize at a lower level than that, as GDP would grow more quickly (however, beware: both sides can do such “dynamic scoring” and R’s take such methods to weird, indefensible places). So who’s right? 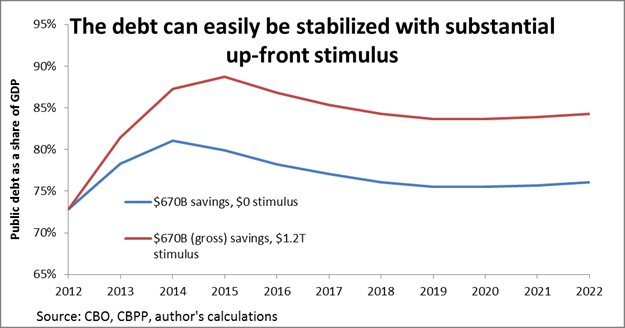 I think the two strongest arguments above for CBPPs approach are a) stabilizing at a lower level leaves us less exposed to higher interest payments when rates finally start to rise, and b) it will be a heavier political lift to argue for a cyclical deficits next time we hit a rough patch if we’re starting at 85% versus 73%. But I can certainly see arguments to the contrary. At the end of the day, economic growth is really the most overlooked variable here. At least in my lifetime, the only time I’ve ever seen the debt ratio fall in earnest was when the economy was at full employment. Though we relentlessly target the numerator of the debt ratio, the real action is in targeting the denominator. That doesn’t invite fiscal profligacy—if you want to hang with the cool kids, you’ve got to be a CDSH. But it does suggest that once again, we’re looking for fiscal rectitude in all the wrong places. *This goal is called primary balance, meaning the gov’t is raising enough revenue to pay its annual operating costs, but must still borrow to pay interest costs. The formula for primary balance is d_2/GDP_2=D_1/GDP_1*(g/1+g) where d=deficit, D=debt and g is the nominal GDP growth rate. Right now, using actual GDP 2012 and CBOs 2013 estimate, the nominal growth rate is 3.1%, and the 2012 debt/GDP ratio is 72.5%. Thus, primary balance for 2013 is a deficit/GDP ratio of about 2.2%. Jared Bernstein joined the Center on Budget and Policy Priorities in May 2011 as a Senior Fellow. From 2009 to 2011, Bernstein was the Chief Economist and Economic Adviser to Vice President Joe Biden. Follow his work via Twitter at @econjared and @centeronbudget.